to a smartphone app and a dedicated doctor’s panel for remote tracking of your results and secure communication. 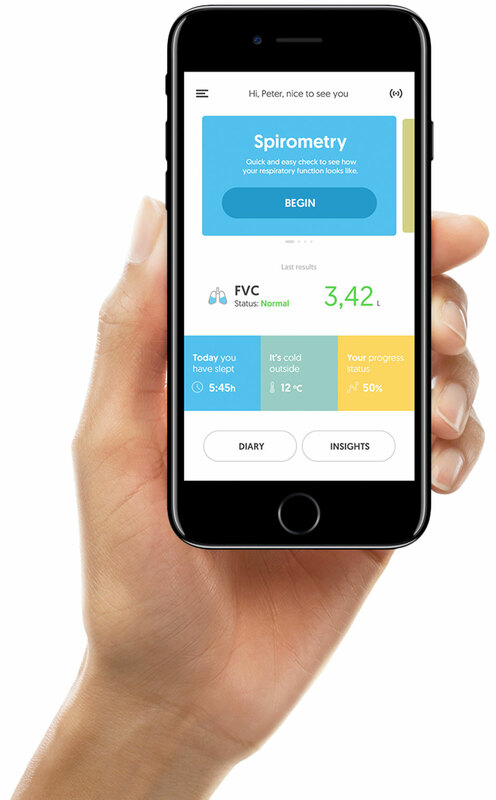 Thanks to dedicated algorithms measuring your lung parameters and symptoms, the device allows you to monitor your health results in real time, and understand how to avoid unexpected consequences of exacerbation of the disease. Tests have never been simpler and more convenient. Limited access to specialist doctors and to the appropriate medical equipment means that nearly 2/3 of patients are incorrectly diagnosed at the first symptoms of pulmonary disease. by the notified body TUV Nord. GDPR compliant. A small, portable device that can be taken anywhere. 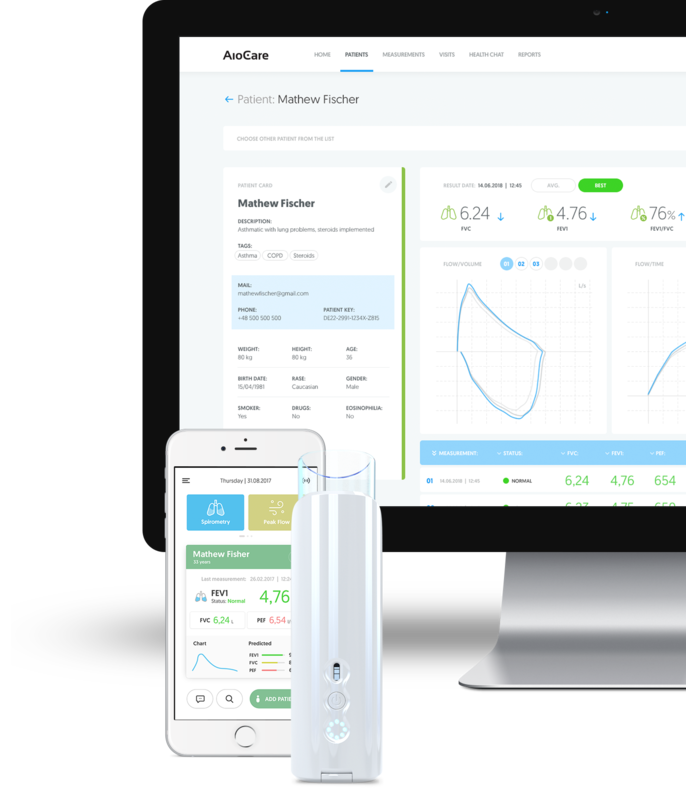 The intuitive interface makes running spirometry tests easy. Test results as accurate as those conducted with medical equipment available in doctor’s clinics and medical centres. 2-year warranty and customer support line. the app to your phone or tablet. Results and feedback instantly available. You can consult the results with your doctor or relatives via the app. with a portable AioCare spirometer. By subscribing to AioCare Patient Gold, you get all the advanced functions to help you effectively manage your disease. If your doctor starts to use AioCare through your recommendation, you will be able to share your results with them in real time and be in constant contact with them. the Patient Gold app free of charge for three months. or integration with IT systems required. Wireless connection. "I have been suffering from asthma for several years. 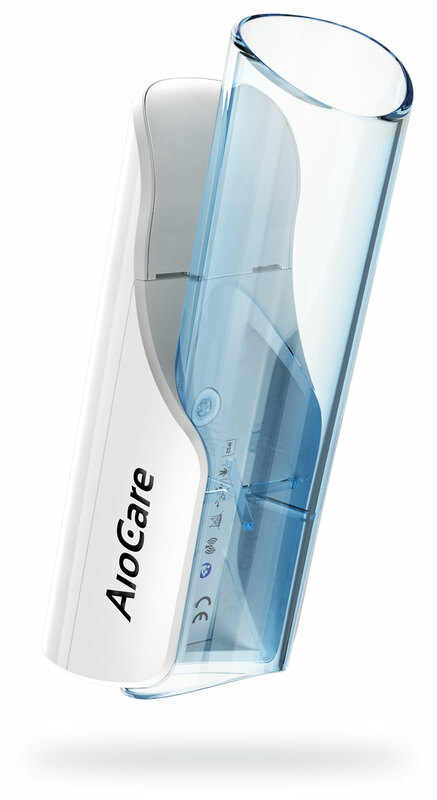 I use AioCare whenever something troubling happens to my breathing. Thanks to that I can easily distinguish an asthma seizure from a simple infection. I don't need to use the inhaled medication right away." "We have distributed the AioCare device to more than 400 GPs in Poland, because it allows a faster and easier COPD diagnosis. It is a breakthrough in the fight against a disease that often goes undiagnosed." "Thanks to AioCare, I’ve learned how to cope with my disease. I monitor my condition almost daily. I observe the symptoms and compare them with the results. Thanks to that I have learned to predict the approaching worsening of my condition." two additional patient profiles for your relatives. 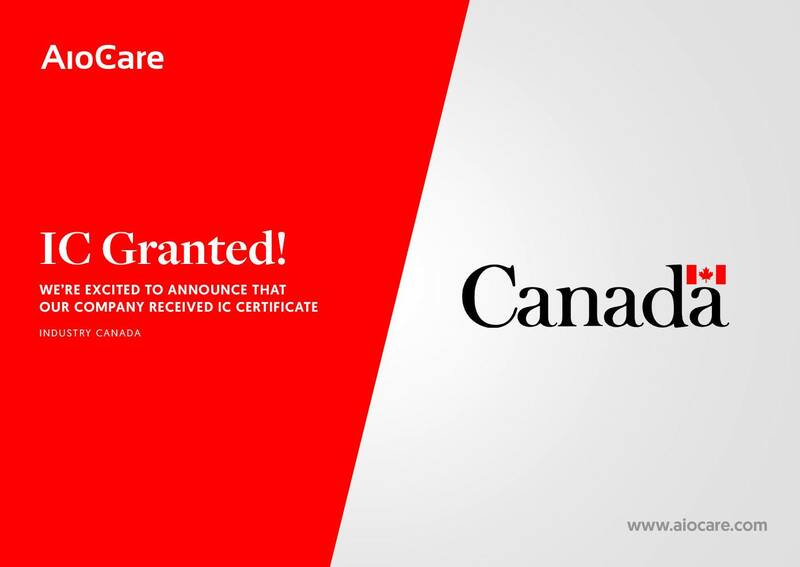 More than 300 doctors and clinics in Poland use AioCare in Poland and it’s still growing! Consent to the processing of personal data for marketing purposes. I agree to the processing of my personal data indicated in the form by Healthup sp. O.o. with headquarters in Warsaw at ul. Twarda 18, 00105 Warsaw, Poland, for marketing purposes related to sending to me commercial and marketing information, coming from the administrator and its business partners, in connection with various forms of marketing activities.